There is always something really spectacular about the sight of a whole pig slowly rotating on our specially designed spit roast: it’s a feast for the eyes as well as the appetite! At Hog Roast Abingdon we have spent many years perfecting our roasting technique and now each and every event we cater for is treated to the luxurious pageantry of our hog roast banquets. With our expertise in slow roasting, we can guarantee that the meats will gently release their delicious aromas throughout your event whetting the appetites of your guests, leaving them fully satisfied and your event a talking point for weeks to come. Our world standard hog roast catering company is our passion: what we don’t know about hog roasting isn’t worth knowing and to prove the point we’ve picked up quite a few awards on the way. Now we devote ourselves to bringing our fantastic service to you. Whether you are arranging a casual get together of friends and family or organising a large corporate event, we have a menu and a service to suit your needs. And we are unbeatable on fine quality at affordable prices. We pride ourselves on sourcing all fresh and local produce, so when you engage our catering services you can be assured of receiving not only an excellent standard of care throughout but excellent quality of food as well. The services we offer include provision of tables and table ware; serving staff; discrete cleaning at the end of the event and of course where would we be without our talented hog roasting chefs! Because Hog Roast Abingdon are so dedicated to the success of your event, we have created several menu’s which we feel reflect the needs of a variety of different types of functions: from our specially prepared salads to apple sauce, warm stuffing and of course crackling, we’re sure you’ll find the right menu for your event. We also offer lamb, turkey, chicken and beef along with vegetarian options, because as we know not all your guests will be carnivorous! 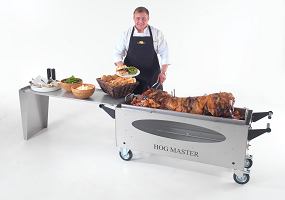 Hog roasting is gaining in popularity all the time and we like to think we had a hand in that! In these difficult times, it is an affordable way to feed large numbers of people with the benefits of being not only a delicious feast, but a nutritious one too. It’s for this reason that we decided to make our specially designed ovens available for hire. So if you’re thinking of organising a barbeque or any other kind of event, why not try Hog Roast Hire Abingdon. Our machines are incredibly versatile and come in two sizes. The smaller size will comfortably roast 35 kg’s of meat or accommodate 15 chickens or turkeys, the larger oven will bear up to 90 kg’s of meat and easily roast 35 chickens. And our ovens are great for all kinds of venues and situations. We have had pub landlords hire our ovens over bank holiday weekends; sports clubs have wanted them for parties, private gatherings where the host wanted to be the chef for the day. The list really is endless with the only similarity being the incredible food and the happily full guests! Being hog roasters ourselves, when we set about designing our ovens, there were some key points we took into consideration: mobility was very important, the oven had to be easily transportable and slim enough to fit through standard doorways. Versatility was another issue we needed to look at: so our ovens come with many attachments to make cooking a diverse range of meats possible. We have the spit roast, the rotisserie, the grill shelf which makes spit roasting and barbequing simultaneously possible. And if all this wasn’t enough, we designed the grill attachment so that pans could be used to make sauces or steam vegetables. The Hog Roast Hire Abingdon ovens come with all these features and functions designed from stainless steel. This gives the ovens a sleek and attractive look, and it also means they are easy to clean and maintain making them a desirable choice for any would be hog roaster. These great ovens are so easy to use that we are completely confident that when you hire one for your event you will be well on your way to dazzling your guests with your amazing cooking skills. They’ll probably be begging you for your secrets! But we know it’s the oven that makes all this wonderful food not just a possibility but a reality!